To say that the play took the steam out of the New York Mets might be an understatement. Because, that’s what seemed to happen Monday when the surprise play of all plays happened in the Cards 5-4 victory over the Mets. NY Met Andres Torres was rounding first and headed toward second. He slid safely into second. As Daniel Descalso used a little too much force while he was tagging Torres out, the Mets thought it would be good to go check Torres out to make sure Dirty Dan … I don’t know… didn’t give Torres a concussion or something! Meanwhile, Carlos Beltran, who was off Monday but taking some swings in the batting cage during this time, saw something that didn’t appear right. 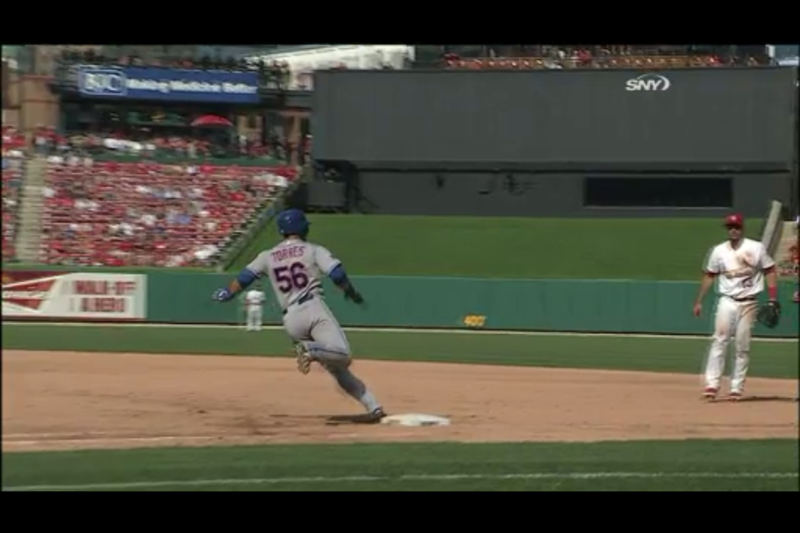 So, he scrambled to the dugout to let Mike Matheny know what he saw… dirt flying as Torres rounded first. A clear indication that Torres didn’t hit the base. During the scrum with reporters later, Beltran said he saw this happen and that it wouldn’t hurt to appeal it. And so, Jason Motte threw the ball over to first baseman Matt Carpenter and BOOM! First base ump David Rackley called Torres out. Mets manager Terry Collins said he’d never seen anything like it. Matheny said Beltran, despite not playing, was definitely the MVP of the game for catching the running mistake. A few other excellent things happened Monday. Let’s discuss! * Skip Schumaker got his first home run of the season. Yeah, waiting until Labor Day to get his first home run. Not good. Instead of the normally awesome receiving line of high fives, Skip’s teammates gave him the silent treatment as he jogged into the dugout. After a few moments of silence, his teammates eventually congratulated him! * Joe Kelly got his 5th win of the season as he pitched 6.2 innings, giving up five hits, two walks and two earned runs, including a home run off the bat of Kelly Shoppach. Kelly was able to strike out four batters though. He also doubled in the third inning. He caused a little bit of concern when it was believed he could have tweaked a muscle in his calf or hamstring, but he jogged safely home after a Matt Carpenter sac fly to center. * Jason Motte nailed down his 33rd save of the season after 1.2 innings of work. He walked one and struck out two. * The Cardinals now have a record of 73-62. They are 8.5 game back of the Reds for the NL Central lead. They remain in the second wild card position They have a half game lead over the Dodgers and a 2.5 lead over the Pirates. The Cards are three games back of the Braves for the first wild card spot. Jaime Garcia takes the mound for the Cardinals tonight against Matt Harvey and the Mets. Game time is at 7:15 p.m. Central at Busch Stadium. Miranda Remaklus is lead St. Louis Cardinals contributor to Aaron Miles’ Fastball. She’s also lead writer at Aerys Offsides. Follow her on Twitter, @missmiranda.